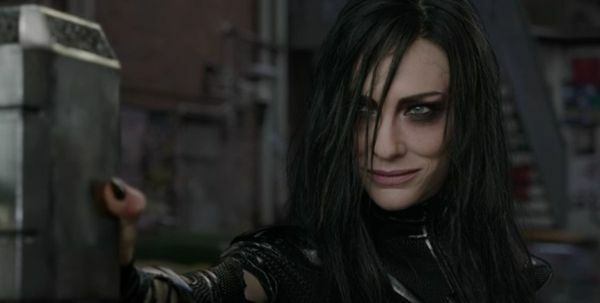 Watch Hela, played by Cate Blanchett, destroy Thor's hammer in a new Thor Ragnarok clip. Notice the difference? Thor is known for his hammer. The hammer, known as Mjolnir, is the symbol of Thor's power and his primary weapon. In the latest Thor movie he loses it thanks to Hela. While we've seen clips of her shattering the hammer, here's the first time we've gotten to see the whole scene. Chris Hemsworth, who plays Thor, stopped by Ellen: The Ellen DeGeneres Show and shared a clip from the upcoming film. The recently found clip shows Hela (Cate Blanchett) taunting Loki (Tom Hiddleston) and Thor by demanding they kneel. When he throws the hammer at her she catches it. Which is surprising since no one can even lift the hammer without Odin's approval as being "worthy". Then she uses her power to shatter it into a thousand pieces. More surprising than that is that the clip shown in previous trailers show a different background. The recently released clip shows them in a field but the teaser trailer shows them in an urban landscape. We don't know if it shows a change in plot or just location, but we'll find out soon. Update: Director Taika Waititi explained why the scene is in a different location. Originally the scene was set in New York City but it was moved to a field during reshoots. Waititi explained to Digital Spy why it was reshot. Without giving away plot points he felt the field was better for the emotional scenes surrounding the event. You can head to the site to get more details if you don't mind spoilers. As for the hammer, chances are he'll get the hammer by the end of the movie, but for now Mjolnir is gone. For more Thor: Ragarok (2017) news, rumors, and hype check back with the Geek Twins! What do you think about the clip comparison for Thor: Ragnarok? I suppose Odin or whoever will be able to reassemble the hammer. I think the original version was better.